Propolis is a bee product, composed mainly of plant resins and beeswax, therefore its chemical composition varies due to the geographic and plant origins of these resins, as well as the species of bee. Brazil is an important supplier of propolis on the world market and, although green colored propolis from the southeast is the most known and studied, several other types of propolis from Apis mellifera and native stingless bees (also called cerumen) can be found. Propolis is usually consumed as an extract, so the type of solvent and extractive procedures employed further affect its composition. Methods used for the extraction; analysis the percentage of resins, wax and insoluble material in crude propolis; determination of phenolic, flavonoid, amino acid and heavy metal contents are reviewed herein. 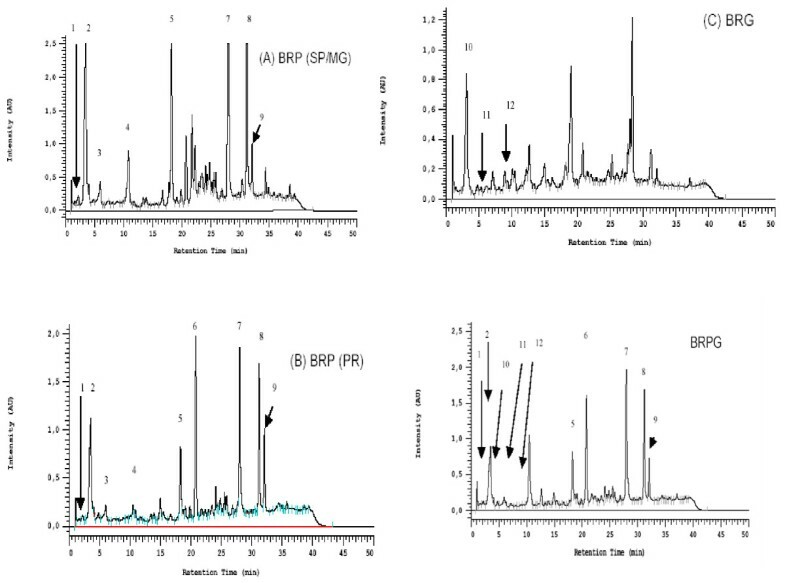 Different chromatographic methods applied to the separation, identification and quantification of Brazilian propolis components and their relative strengths are discussed; as well as direct insertion mass spectrometry fingerprinting. Propolis has been used as a popular remedy for several centuries for a wide array of ailments. Its antimicrobial properties, present in propolis from different origins, have been extensively studied. But, more recently, anti-parasitic, anti-viral/immune stimulating, healing, anti-tumor, anti-inflammatory, antioxidant and analgesic activities of diverse types of Brazilian propolis have been evaluated. The most common methods employed and overviews of their relative results are presented. Propolis is a bee product, composed mainly of plant resins and beeswax, therefore its chemical composition varies due to the geographic and plant origins of these resins. In regions of temperate climate, such as Europe and North America, Apis mellifera bees obtain resins mainly from the buds of species of Populus [1, 2] and the main bioactive components are flavonoids. A. mellifera line their hives and even cover dead invaders with propolis, due to its antimicrobial properties . In countries such as Brazil, where equatorial, tropical and sub-tropical climates can be found, the plant origin and chemical composition of propolis is far more varied. In addition to the introduced honeybee species, A. mellifera¸ there are hundreds of species of native Brazilian stingless bees that also mix plant resins with wax (cerumen) and sometimes clay (geopropolis) and use this as construction material and as defense against predators and disease . Propolis has been used as a popular remedy for several centuries, mainly due to its antimicrobial properties, present in propolis from different origins , but it is also taken orally and applied externally for a series of diseases, ranging from tumors to parasites . Brazil is an important supplier of propolis on the world market . As green colored propolis from the southeast has been exported for many years, it became known as Brazilian propolis. Therefore green Brazilian propolis has been the most thoroughly studied and its composition and biological activity is the subject of an earlier review . However, several other types of propolis can be found in Brazil and their chemical composition and biological activity are presently under study. An overview of the different methods applied to the study of Brazilian propolis, with emphasis on how these methods have evolved, will be presented herein. Crude propolis contains plant resins, beeswax and insoluble material. Several procedures may be used to extract its bioactive components. One of the factors that affects the yield and composition of the ethanolic and hydro-ethanolic extracts of propolis is the concentration of ethanol used; solvents containing 70% of ethanol or more extracted more propolis resins by maceration. The use of a Soxhlet extractor shortened the extraction time and increased the yield . The yield was also affected by the amount of time the crude propolis was macerated, with an increase in yield of extracted components from 60.1% (m/m) after 20 days maceration to 67.0% (m/m) after 1 year. As the qualitative composition of the extracts was similar, the use of prolonged maceration periods (over 20 days) are not economically justified . This pattern was the same for samples of green, brown and red Brazilian propolis, as well as for samples of propolis from temperate regions. Propolis extracts can also be obtained by turbo-extraction, which reduces the extraction time to less than one hour, without using heat. Extracts containing 5 to 30% (m/v) crude propolis in solutions containing between 60% and 96% ethanol were evaluated. The highest concentration of phenolic compounds was obtained using solvents with lower concentrations of ethanol and higher concentrations of crude propolis; but the highest concentration of flavonoids in the extract was obtained with higher concentrations of ethanol in the solvent . For some applications, the alcoholic content of the solvent is not desirable, so alternatives to ethanolic extraction have been tested. Pure water may be used, but results in a lower yield of extract which doesn't contain the less water soluble components of propolis [12, 13]. Edible oils, such as canola oil, present an interesting alternative. The qualitative composition of the oil extract was similar to the ethanolic extract of the same sample of green Brazilian propolis. However longer extraction times were necessary and lower yields of phenolic compounds were obtained . Supercritical extraction was applied to the dried ethanolic extract of green Brazilian propolis, with the objective of obtaining fractions enriched with specific components. Pure CO2 is an ideal solvent, as it evaporates after extraction, resulting in a dry extract without solvent residue. Although extraction yields of up to 13% were obtained, the presence of ethanol was deemed vital for the fractionation process, as CO2 alone did not successfully extract the relatively polar bioactive compounds . The use of surfactants has been tested to incorporate the less polar components of propolis in water based products. Microemulsions are stable, multi-component fluids and have been the subject of intensive research over the last few decades. A propolis sample from the north of Brazil was extracted with ethanol and incorporated in emulsions containing different compositions of Tween 20, Tween 80, alcohol and water. The microemulsions were active against gram positive bacteria . Although there is a tendency to substitute ethanol or incorporate the dried ethanolic extracts of propolis in other formulations to minimize the irritant effect of alcohol on mucous membranes or when taken orally; ethanol continues to be the most frequently used solvent for propolis extraction. As crude propolis contains alcohol soluble resins, wax and insoluble material, the amount of each of these components is often used as an indication of propolis quality. Brazilian legislation determines an acceptable minimum of 35% (w/w) ethanol extractible components, and a maximum of 5%(w/w) ash and 25% (w/w) wax content . Crude propolis containing greater amounts of wax and insoluble materials than the usual may have been admixed with these cheaper components, or come from a region where the bees could not obtain a satisfactory amount of resins in neighboring plants. In both cases, the amount of alcohol extractible bioactive resins will be lower. Both the ash contents of crude propolis  and/or low contents of ethanol soluble residue [9, 18] have been used to evaluate this parameter. The wax contents are usually determined by freezing the ethanolic extracts overnight (-16°C at least) and separating the precipitated wax by filtration at this temperature . An excessive amount of moisture in crude propolis is indicative of inadequate storage or manipulation conditions. Although the amount of water may be determined by different procedures, usually the sample is submitted to a temperature of 100°C until constant weight, with a maximum of 8% humidity considered acceptable . European propolis contains many flavonoids, such as galangin and pinocembrin, which are responsible for most biological activities [19, 20]. Therefore initial studies of Brazilian propolis were frequently focused on this class of compounds. The spectrometric method using AlCl3 as reagent is still frequently used  with a calibration curve constructed using quercetin (although this flavonoid is not commonly found in Brazilian propolis). Subsequent studies showed that the phenolic contents of green Brazilian propolis were higher than the flavonoid contents  so the total phenol content became a standard test, usually determined by the Folin-Ciocalteau method  with calibration curves using phenol  or gallic acid  as standards. Phenolic contents between 6.4 and 15.2% (m/m) have been reported for ethanolic extracts of green Brazilian propolis [4, 21]. Brazilian legislation accepts minimum flavonoid contents of 0.5% (w/w) and minimum phenolic contents of 5% (w/w) in crude propolis . Both phenolic contents and flavonoid contents of green Brazilian propolis have been found to correlate positively with the antioxidant activity of samples . However, some acetophenones found in green Brazilian propolis also react with AlCl3, and may be incorrectly included in the total flavonoid contents , giving misleading results. Red Brazilian propolis, which contains benzophenones , and stingless bee cerumen [25, 26], which contains di-terpenes and tri-terpenes, will not be adequately evaluated by these methods. Therefore, it is important to characterize the sample composition before attempting to quantify the actual bio-active compounds. Chromatographic methods are more adequate for compound identification and quantification. Other analyses applied to propolis samples include the identification of amino acids , which may come from pollen pellets often incorporated in propolis. The presence of metals in crude propolis samples  was evaluated by X-ray fluorescence. Although the concentration of lead in the crude samples was above the maximum permitted for food, most of the lead remained in the insoluble residue after ethanol extraction, so the ethanolic extracts were practically lead-free. Many chromatographic techniques have been applied to the analysis and isolation of propolis components. Open column chromatography (CC) was used in early studies to isolate lignans  and diterpenic acids  found in propolis from Parana state and, more recently, tri-terpenes, isoflavones, phenolics and benzophenones in red Brazilian propolis . The complex matrix of propolis can be divided into fractions by open column chromatography, in an effort to reduce the components in each fraction which might be responsible for a given biological activity [31, 32] and then identify the compounds in the active fraction by other means. Liquid/liquid extraction has also been used for this purpose . Thin layer chromatography (TLC) can be used to compare propolis samples, or different types of extracts of the same sample of propolis [34, 35]. Certain biological activities such as anti-fungal, antibacterial and antioxidant activities can be determined directly on the TLC plate, and the compounds responsible for these activities extracted from preparative TLC plates and identified by other means. The use of TLC for propolis characterization is rather limited, as the number of components is too great for adequate separation. Identification and quantification of components directly on TLC plates is further restricted by the fact that commercial standards are not available for many propolis components. Gas chromatography - mass spectrometry has been successfully applied to the analysis of essential oils from stingless bee cerumen  and volatiles of propolis from different regions in Brazil . However, for the more polar compounds found in ethanolic extracts of propolis, derivatization with BSTFA was necessary to make the extracted compounds more volatile [10, 37–39]. This hindered the search for compounds in data bases; as many compounds were present as mono-, di- and tri-TMS forms . As propolis extracts are soluble in ethanolic and hydro-alcoholic solutions, reverse phase High Performance Liquid Chromatography (HPLC), has become the most commonly used chromatographic method for propolis analysis. Phenolics and flavonoids absorb in the UV-Vis range and can easily be detected with a diode array detector (DAD) [40–42]. HPLC-DAD has been applied to the typification of Brazilian propolis (Figure 1) . It has also been successfully applied to the identification and quantification of components in fractions of propolis obtained by open column chromatography [31, 32]. However terpenes absorb poorly and sometimes go undetected unless a different detection method (such as mass spectrometry) is used. For example, the samples of stingless bee propolis analyzed in Miorin et al., (2003)  had few identified and quantified components, in spite of showing antibacterial activity, since the main components of this type of propolis are di-terpenes and tri-terpenes [25, 43]. The search for faster screening methods, capable of characterizing propolis samples of different geographic origins and composition, has lead to the use of direct insertion mass spectrometric fingerprinting techniques. Most bioactive compounds in propolis contain phenolic (acid) groups, so negative ion electrospray ionization mass spectrometry [ESI(-)-MS] presented the best results, as demonstrated with samples of Apis mellifera propolis from different geographic origins . In that study, differences between samples of green propolis from the southeast, brown propolis from the south and two types of red propolis from the northeast of Brazil were detected by the marker ions that stood out in the characteristic mass spectrometry fingerprints of each sample. The samples were grouped by principal component analysis (PCA) of the ions found in the spectra. ESI(-)-MS fingerprinting was applied to a study of the effect of the maceration time on extraction yields, showing that samples macerated between 20 days and one year had qualitatively the same composition . 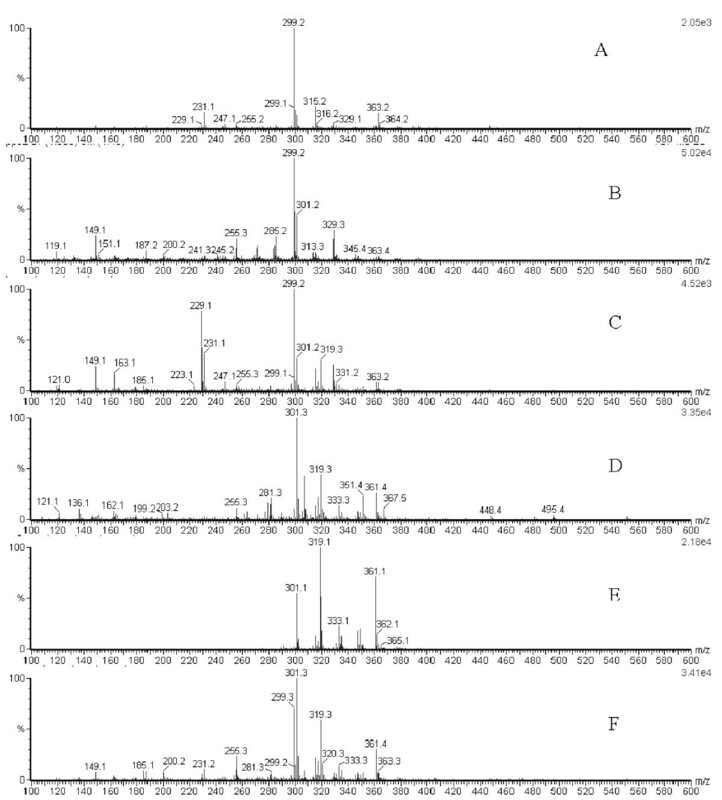 ESI(-)-MS fingerprints of oil and ethanol extracts of the same sample of green propolis showed the similarity in their qualitative composition . Fractions of this oil extract were also characterized by ESI(-)-MS, however, HPLC-MS/MS was employed to confirm the identity of target compounds. The combination of chromatographic retention time and collision induced dissociation permits the unequivocal identification of the components . Propolis from the south of Brazil, subjected to different extraction procedures, presented, however, different ions in their fingerprints . The ESI(-)-MS fingerprints of samples of A. mellifera propolis and of their plant resin sources (Figure 2) show how clearly the qualitative composition of the samples can be compared by this method . Direct insertion ESI(-)-MS fingerprinting was also applied to samples of Tetragonisca angustula cerumen (a native stingless bee known as jatai) from the south, southeast and northeast of Brazil . The results were surprising, as certain marker ions were consistently found in all the jatai samples, indicating the same plant source for the resins in all those regions. These marker ions were found in resins from different parts of Schinus terebenthifolius, but mainly in the flowers. The same ESI(-)-MS fingerprinting method was applied to an expanded number of samples (including other species of stingless bees and two more regions, the Midwest and North of Brazil), and the resulting MS fingerprints analyzed by PCA. The samples were placed into three distinct groups  by their marker ions, which were related to the plant resins found in those regions. Comparison of the cerumen of the Scaptotrigona bees collected monthly from two distant regions in Brazil by ESI(-)-MS fingerprinting showed that the samples varied according to the species of bee, month of collection and geographic origin . However, samples from both regions presented marker ions from S. terebenthifolius resins in their fingerprints, but only those from the southeast presented marker ions from Araucaria resins; which correlate well with vegetation in both locations. Easy ambient sonic-spray ionization mass spectrometry (EASI-MS) is a new and fast ambient technique which allows a droplet of ethanolic extract of propolis to be ionized directly from an inert surface, without previous sample preparation or dissolution, taking approximately one minute per sample. This method was applied to 49 samples of Apis and stingless bee propolis from the Americas, Europe, Asia, the Middle East and Australia . The EASI-MS negative ion mode fingerprints were found to be quite similar to the ESI(-)-MS of the same samples and the PCA grouping of the fingerprints correlated well with those in previous studies [25, 45]. Direct insertion mass spectrometry fingerprinting (ESI(-)-MS and EASI-MS) has proven to be a fast and robust method for propolis characterization, however chromatographic separation is still necessary for compound quantification and unequivocal identification. Fast chromatographic techniques, such as ultra-high pressure liquid chromatography - mass spectrometry (UHPLC-MS), will be useful for fast quantification of compounds in Brazilian propolis in the near future. Anti-microbial activity is frequently tested as it is common in propolis samples and many methods have been employed, with varying degrees of success. The method of diffusion in agar (using cups, steel cylinders or paper disks) is often used for screening samples against an array of microorganisms and the parameter for activity is the diameter of the inhibition zone. This can be misleading, however, as water-soluble components tend to disperse more effectively in the agar, resulting in wider inhibition zones. This was clearly observed in comparative assays of green Brazilian propolis extracted with different concentrations of ethanol in water against species of Candida  and Gram-positive Staphylococcus and Streptococcus ; the clearest results were obtained by serial dilution in tubes and on plates. But, keeping this limitation in mind, agar diffusion was used to determine the activity of extracts of cerumen from several species of stingless bees against Staphylococcus aureus, Escherichia coli and Candida albicans. Although most were active against S. aureus, their activity against the other two microorganisms was weak or insignificant . Isolated compounds from red propolis were tested against S. aureus and E. coli . To evaluate the fungicidal activity of green and red Brazilian propolis against C. albicans, Sporothrix schenckii and Paracoccicoides brasiliensis, an inhibition zone of less than 15 mm was considered lack of activity and all extracts presented similar activity . As it would be impossible to evaluate the activity of an oil extract of propolis directly on agar plates due to diffusion problems, the compounds were re-extracted from the oil and then diluted in ethanol, in order to compare their activity against gram positive and negative bacteria. The extracts were active against S. aureus and Listeria monocitogenes but had little to no effect on E. coli, Salmonella tiphimurium and Pseudomonas aeruginosa . A similar assay may be performed using extract-saturated discs of filter paper placed on agar plates, and measuring the growth inhibition zone. The disk method was used to evaluate the activity of compounds isolated from green Brazilian propolis against P.aeruginosa, E. coli, S. aureus and Streptococcus faecalis . The Gram-positive bacteria were more susceptible to the compounds. Broth dilution methods and micro dilution methods present more consistent results, as the components of the sample necessarily disperse in the medium. The minimal inhibitory concentration (MIC) against S. aureus of samples of Apis mellifera propolis from the south of Brazil and T. angustula cerumen from the southeast were determined by tube dilution but were found to vary between individual samples . The MIC of green and red propolis against Streptococcus pneumonia, S. aureus and Klebisiella pneumoniae were determined by broth micro dilution: none of the extracts were active against K. pneumonia, but were active against the other two bacteria. Correlations were found between the concentration of caffeic acid and caffeoylquinic acids in the sample and the bactericidal activity . The ethanolic extract of propolis from the south of Brazil was tested against endodontic pathogens (Prevotella nigrescens, Fusobacterium nucleatum, Actinomyces Israeli, Clostridium perfringens) and against Enterococcus faecalis by macro dilution. P. nigrescens was the most susceptible, F. nucleatum and C. perfringens had intermediate results and A. israeli and E. faecalis were the most resistant . Bioautography is a combination of TLC and diffusion in agar, in which the extracts are spotted on chromatographic plates, with or without chromatographic development, and the plates are subsequently covered with agar containing a microorganism. Areas in which the growth is inhibited indicate compounds or samples with antimicrobial activity. This method was used to evaluate the activity of essential oils and ethanol extracts of samples of Brazilian propolis from the states of São Paulo, Paraná and Ceará against S. aureus  and of diterpenic acids isolated from propolis from the state of Paraná . In another study, the essential oils of cerumen from four species of native stingless bees were tested and found to be active against S. aureus but not against E. coli . Bioautographic analysis of green propolis extracts permitted the identification of active components of the extracts against C. albicans  and against S. aureus . Of the antioxidant evaluation methods used, the DPPH assay, based on the reaction of the stable free-radical (2,2-diphenyl-1- picrylhydrazyl) with components of the sample, evaluating a change in the color of the solution, is the most frequently used. A comparison of the antioxidant activity of propolis samples from various countries, including Brazil, was carried out using this method . The antioxidant activity of isolated compounds of red Brazilian propolis was evaluated by DPPH, with two benzophenones presenting the best results . A slight antioxidant activity was detected by DPPH in Scaptotigona cerumen, and varied according to the composition of the samples . Propolis samples from 3 cities in the state of Ceará, in the north of Brazil, were evaluated by DPPH, and the samples with higher phenolic and flavonoid contents showed the highest antioxidant activity . Both DPPH and the ferric reducing ability assay (FRAP) were used to evaluate the same propolis extracts from the south of Brazil. The results of the DPPH assay correlated well with the flavonoid contents of the samples, but the results of the FRAP assay did not . The phenolic contents correlated well with the results of both assays. Another method that can evaluate the antioxidant effect of propolis is the chemoluminescenscence assay, which was applied to samples of green propolis collected monthly for one year. The antioxidant activity was found to vary with the different seasons . The capacity of a compound to inhibit lipid peroxidation is another way to evaluate the antioxidant activity. Green propolis samples, as well as isolated compounds, were tested and 3-prenyl-4-hydroxycinnamic acid was found to have the highest antioxidant activity by this method . As the choice of the method used to evaluate the antioxidant activity of a sample can bias the results, the use more than one method for this assay is recommended. Trypanozoma cruzi is an endemic parasite in some regions of Brazil. Bloodstream trypomastigotes were treated with samples of green Brazilian propolis from the state of São Paulo, extracted with different concentrations of ethanol. The extract concentration that lysed 50% of the parasites (ED50) was calculated by counting the parasites in 96 well plates. The best result was obtained with a sample extracted by Soxhlet using 100% ethanol . Compounds isolated from green propolis were also assayed by this method, and 3-prenyl-4-hydroxycinnamic acid, 2,2-dimethyl-6-carboxyethenyl-2H-1-benzopyran, and 2,2-dimethyl-6-carboxyethenyl-8-prenyl-2H-1-benzopyran showed trypanocidal activity . The same assay was used for the comparison of red and green Brazilian propolis. A positive correlation was found between trypanocidal activity and the concentration of 3,5-diprenyl-4-hydroxycinnamic acid in the samples . Another endemic parasitic disease is caused by Leishmania amazonensis. The effect of red, green and brown Brazilian propolis on promastigotes, amastigotes and macrophage cultures were evaluated. Red (BRV) and green (BRP-1) propolis samples were not toxic to macrophages but inhibited intracellular parasites . Green propolis from the southwest of Brazil was tested using mouse models of pain and inflammation, as well as in in vitro cell cultures. The sample showed significant analgesic and anti-inflammatory effects, but was ineffective in the hot-plate test. In vitro experiments demonstrated that the sample inhibited the production of NO and inhibited nuclear factors involved in the inflammatory process . Whereas the in vivo experiments indicated the presence of anti-inflammatory activity, the in vitro tests were able to indicate the mechanism of action. One of the main components of green Brazilian propolis, 3,5-diprenyl-4-hydroxycinnamic acid, was tested against similar in vivo and in vitro models of inflammation indicating that this compound is at least partially responsible for these activities. Furthermore, there was good oral absorption of this compound, so it may be taken orally for pain and inflammation . Other evaluations of the in vivo analgesic activity showed that this activity was not related to opioid receptors . A new line of research involving propolis involves its possible application as a vaccination adjuvant, although most commercial vaccines use aluminum salts to this end. A sample of green Brazilian propolis was tested, together with other adjuvant compounds, to immunize mice against inactivated swine herpes virus (SuHV-1). When administered together with aluminum hydroxide, the propolis extract increased both cellular and humoral responses . A combination of an inactivated oil vaccine against bovine herpes virus type 5 and propolis extract also increased the humoral immune response in cattle . Fractions of green propolis were tested against SuHV-1. Fraction J, containing an expressive amount of caffeic and cinnamic acid derivatives, proved to be most effective, increasing both humoral and cellular responses, possibly due to the mitogen activated p38 signaling pathway. In a previous study, when the propolis extract was tested alone, it was not as effective, possibly due to the presence of both immunostimulatory and immunosuppressive substances . A slight anti-allergic effect has been observed with Brazilian propolis . Some propolis compounds affect enzymes that control airway responsiveness. Therefore, the effect of green propolis and of compounds isolated from green propolis on guinea pig trachea  was evaluated. Both the propolis extract, as well as the individual compounds, showed relaxant activity. Five samples of Brazilian propolis from the south and southwest of Brazil presented hepatoprotective effects on primarily cultured mouse hepatocytes, but one sample presented a hepatotoxic effect. Although the methanolic extracts were more active than the water extracts, no correlation between composition and effect was discussed . Furthermore, tests of Indomethacin-induced ulcers in rats showed a strong gastric mucosa protective effect of propolis from the state of Paraná. This effect may be associated to antioxidant activity, quenching free radical species indirectly generated by Indomethacin . The same type of propolis also showed a protective effect against liver injury induced by CCl4 in mice, which may also be correlated to its antioxidant activity . Some possible toxic effects of certain types of Brazilian propolis have been evaluated. The acute toxicity of propolis from the state of Paraná was evaluated using male Swiss mice and was not considered toxic as the LD50 was higher than 5 g/kg of body weight . Cerumen from Brazilian stingless bees was tested with the Artemia salina lethality assay and, while some samples presented surprisingly high cytotoxicity, others could be considered non-toxic . The anti-proliferative effects of different types of propolis and extracted with different solvents were evaluated against several tumor cell lines [14, 52, 67]. In an in vivo experiment using Swiss mice inoculated with sarcoma 180 tumor cells  the propolis treatment managed to reduce the tumor growth. No toxic side effects were observed on mice weight or biochemical parameters. The analytical methods applied to propolis research have evolved over the years, driven by the need to identify the components responsible for its biological activity and to guarantee the quality of propolis containing products. Whereas in early studies the amount of resins, wax, moisture and insoluble material was considered a good indication of sample quality, soon the identification and/or quantification of a class of compounds, such as flavonoids or phenolics, became necessary. As different types of propolis composition were characterized, the presence of new classes of bio-active compounds was determined and the need for more sophisticated techniques became clear. Chromatographic methods were used to separate the complex propolis matrix into fractions, isolate and help identify and quantify propolis components. Fingerprinting techniques, such as ESI-MS, may be applied to sample characterization and the determination of plant origin of samples, but chromatography remains necessary for compound quantification. As the activity of propolis, like many natural products, may be due to the synergic effect of several bio-active components; it will be necessary to distinguish between types of propolis and follow complex compositions to guarantee specific biological activities. Therefore fast chromatographic techniques coupled with mass spectrometry should be the tool of the future for research and quality control of propolis-based products. In the biological assays there is a trend towards substituting, or at least complementing, animal based studies that indicate an effect, with in vitro enzymatic studies that determine the mechanism of action. However, animal studies are still important to identify the bio-availability of propolis compounds as well as imunomodulatory, gastric and hepatoprotective effects. One of the most traditional activities related to propolis is its antimicrobial activity. Studies using macro- and micro-dilution present the most consistent results. The bio-assay of fractions and isolated compounds permits the determination of the active constituents; bioautography may also be used to this end. But the possibility of synergism between diverse compounds in the propolis sample must be kept in mind when evaluating antimicrobial and other activities, including the recent results against neglected endemic parasitic diseases, T. cruzi and L. amazonensis. The complex composition of propolis may explain, in part, why the same type of propolis presents apparently contradictory results, for example: green propolis has been found to have anti-inflammatory, anti-allergic and immunostimulatory activities. Another apparent contradiction, between the anti-cancer activity of propolis and its generally low toxicity, may also be due to the complex composition of the samples. Overall protective effects may be correlated to the antioxidant and imunomodulatory activity of propolis components. Whereas further studies to determine the compound(s) related to each of these activities and their mechanism of action should be carried out, the possibility of synergy between compounds must be considered. Whereas in the past propolis was not expected to vary much in composition, and phenolics and flavonoids were considered the main bio-active components, this concept has now changed. All future studies must be precise as to the type of bee and plant source of the propolis sample, as it is now clear that these factors determine its composition and activity. ACHFS would like to thank CAPES for a Post-doctoral fellowship. ACHFS, IBSC and MCM have all been involved in drafting this review and have given final approval of the version to be published.